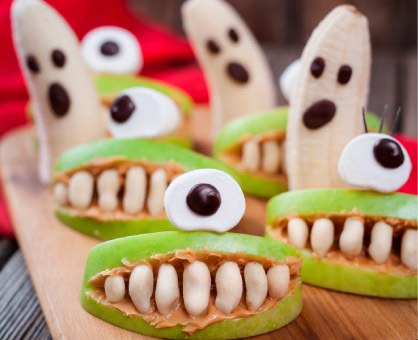 Halloween can be ghoulish for people on a diabetic meal plan. With the help of this spooky treat guide, it’s fun to make and enjoy low-carb, low-sugar treats. apple bites: Quarter and core an apple, cut a wedge from the skin side of each quarter, spread with peanut butter, then press slivered almonds in place for teeth. Baste the apples with orange juice to keep them from browning. Use sunflower or pumpkin seed butter for a nut-free option. banana ghosts: Press three chocolate chips (two for the eyes, one for the mouth) into half of a peeled banana so that they resemble a ghost face. orange jack-o’-lanterns: Use Mandarins, clementines or full size oranges. Draw a face with a black permanent marker (it won’t penetrate the skin so the fruit won’t be contaminated). It’s fun for children to see how scary or funny they can make the jack-o’-lantern’s face. spooky cheese slices: Cut slices of Swiss, Cheddar or colby cheese into spooky shapes using Halloween cookie cutters. finger food: With a paring knife, cut a flat, shallow notch in the tip of a baby carrot. Then use a dab of softened cream cheese to “glue” a sliced-almond “fingernail” atop each notch. Cut in a few more notches to shape a knuckle. Serve with your favorite vegetable dip. Use this same cutting technique with a piece of string cheese.